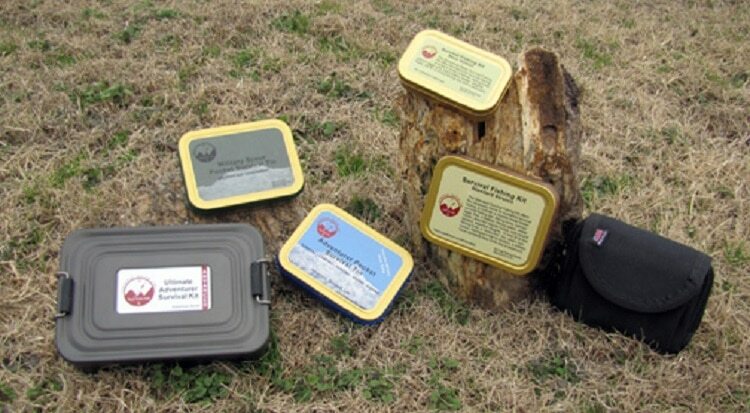 When you go on one of those crazy outdoor adventures and want to try your luck at fishing, a survival fishing kit is of absolute importance here. This will ensure that your fishing trip goes smoothly without any issues. A good survival kit must contain the basics including the hooks, ropes, and all the other tools that can help in fishing expeditions. Also, it should be lightweight; this is one of the essential features for a good survival kit for fishing. It is difficult to carry heavy objects when you are backpacking in outdoor locations, but you know that already. There are so many fishing kits available in the market that it really becomes difficult to choose the perfect one. 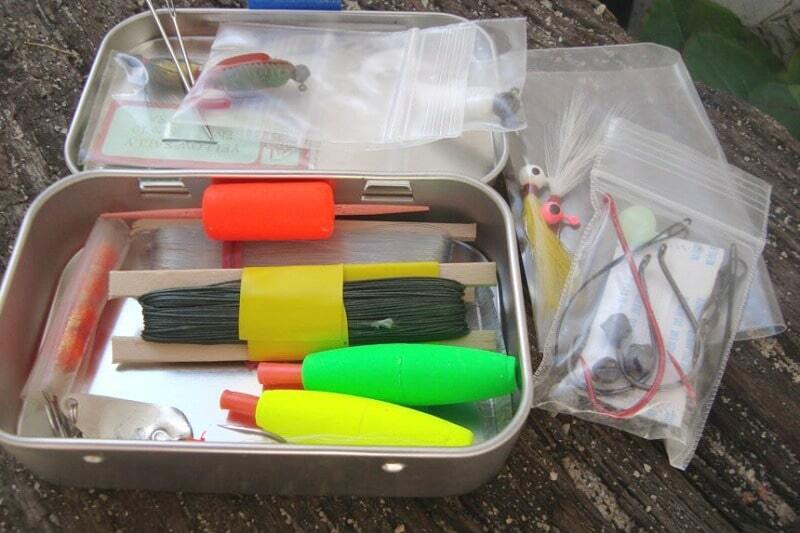 To help you, we did a quick review of one of the best survival fishing kits on the market. So, if you want to know more about features and characteristics, continue reading. 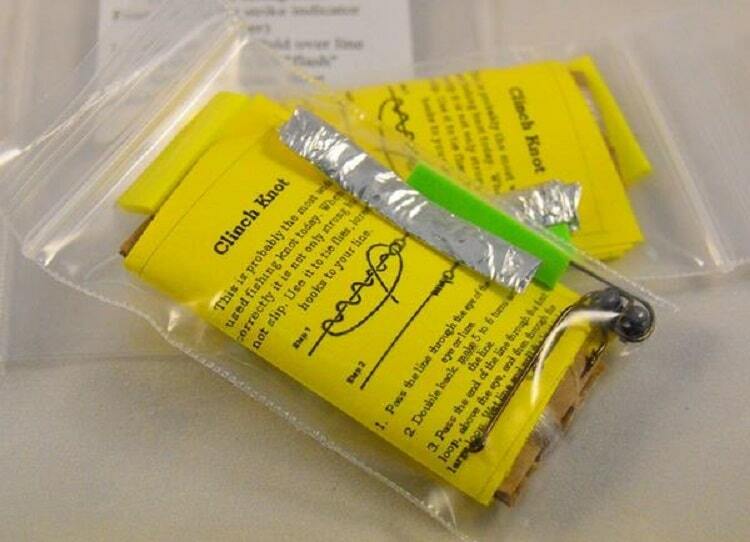 When we talk about the basics of a fishing survival kit, the Glide Emergency Survival Fishing Kit is one of the best products available on the market. We say this because it has all the specific features of a fishing trip. 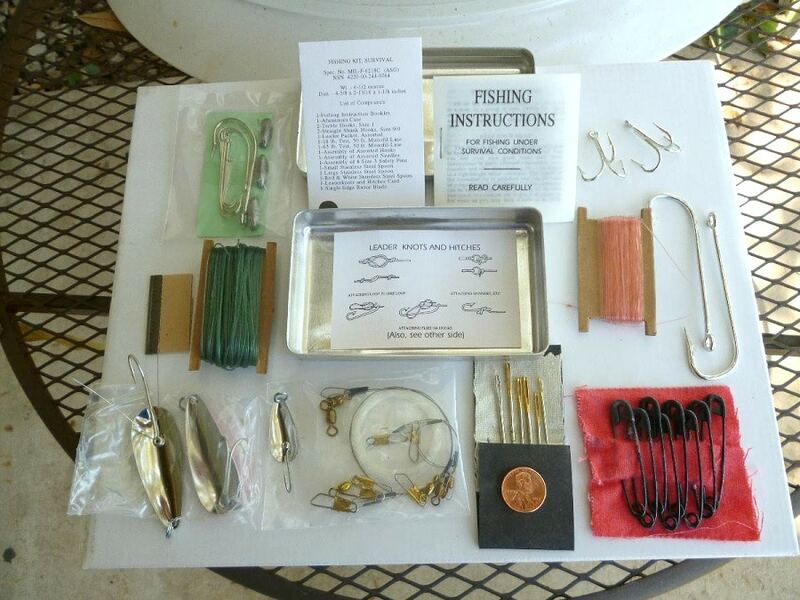 For instance, it comes with just the right items like hooks, line, bobber and the likes. The Glide Emergency Survival Fishing Kit has a total of 15 items, all of which can come handy for you. Besides, more importantly, all the contents are fit into a container of the size of a sardine box. Why Choose This Fishing Kit? Glide Emergency Survival Fishing Kit is designed by avid fishermen, with years of experience in this field, who are aware of the exact tools required for this trade or activity. This makes the kit a more useful product because of the quality of products used and the choice of tools. The kit is entirely assembled in the USA that gives us an idea of the compatibility of the users with the tools. Each item has been put together with utmost care catering to the fishing trips in the USA and other areas. A feature that makes this product a really attractive one is the quality of the tools incorporated in it. Most of the items are manufactured by named brands that are known for their expertise in the respective fields. What this does is assures the users of the quality of the products they are investing in. The survival kit is absolutely waterproof which ensures that irrespective of where you go the contents will stay dry and safe. Besides, it is free from moisture such that you can keep it stored with you for a long time without hassles. Jig head(2) : 2 in number, 1/16 unpainted, round. This super-durable and useful emergency survival kit for fishing activities is a rather compact pack with all the necessary items. The best part about this kit is that it can be accommodated in your pockets quite easily. It comes in the size of a sardine can (approximately) and is very convenient to carry around with you. The dimensions of the product are 2.5W x 4L x 1H inches. This kit comes with a lot of extra space that you could make use of. For instance, in spite of having all the components tightly packed, there is still space for other items to fill in. In this case, this product basically acts as a ‘build-on’ kit which can be customized to your own needs. You could add some hooks, blade, a piece of foil for making your bait more attractive. Not just that, you could add a number of other tools and gear required for a fishing or camping trip. One of the important considerations to be made for making a survival kit is the weight of the box you carry. For outdoor adventures, you cannot be carrying a huge weight on your back. This is where Glide Emergency Survival Fishing Kit really outshines its contemporaries. This is a rather light kit that has all the important components and yet manages to weigh less. Because this product is not at all bulky, it can be used for purposes like camping and hiking rather frequently if fishing is one of your favourite activities during those outdoor trips. Water resistance can really bring you a lot of luck when you are going out on a fishing trip. This is because, for a survival kit, you need to be prepared all the time for changing weather conditions and other issues. This particular product comes in a water-resistant tin box that ensures that the contents remain dry and protected at all times, irrespective of the weather or terrain. One of the reasons why this product proves to be portable is the size. Because it comes in the size of a small sardine can, this makes it easy to carry it around in your pocket such that you are not carrying a huge box in your hiking backpack. The addition of a silica gel desiccant to the contents of the Glide Emergency Survival Fishing Kit makes it all the more useful because it will keep your kit free from moisture. This is important because you would usually camp in unknown locations with the survival kit stacked up in your bag for days. So when you bring it out to use it, it should not be wet and soaking. 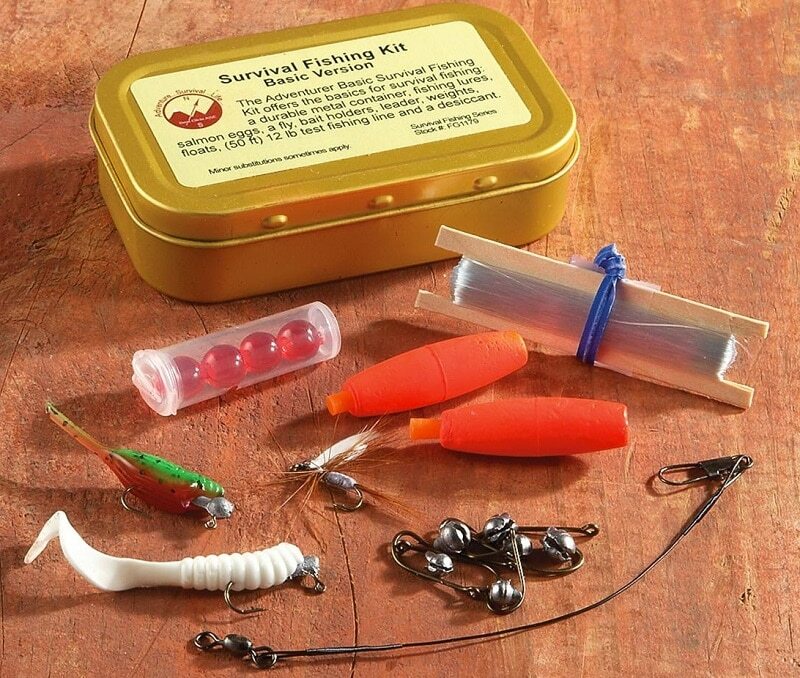 The price for this survival kit for fishing operations might be a little on the higher side. In spite of being quite spacious, the components of the kit together could have been obtained at a lower price. This is one of the factors that actually prove to be a disadvantage for the users and potential fishing enthusiasts. 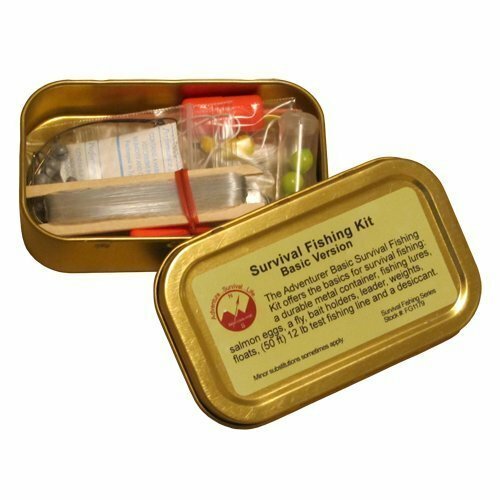 Even though there are 15 different pieces of survival and emergency tools in Glide Emergency Survival Fishing Kit, it would have been a lot better if there were a few more. There is a lot of extra space and some more tools would make this a complete kit to be carried everywhere during the camping and fishing trips. In the end, if you want a small survival kit that is lightweight and can be carried around in your pocket, this particular product is the best option for you. This comes with a set of 15 tools that can be useful for those long fishing trips. It also helps that you have a fishing rod on the go. Read our popular piece on how to choose the top telescopic fishing rod to help you with more choices. There are various similar products in the market that you can get your hands on so let’s talk more about these too. As you can understand, the Best Glide Emergency Survival Fishing Kit is not the only option at your disposal, which brings us to the Survival Fishing Kit – standard version. The first thing you will notice here is the lightness of the case despite being fully stocked for all situations, which is not something you get in many survival fishing kits. This product is particularly designed keeping in mind the idea of standard emergency kit. Moreover, in terms of utility items, you are going to be floored by how carefully stocked it is, and all that at such a low cost. As for utility items, you will find that the kit comes in a tin can which is sealed with the help of water-resistant tape. Other utility items you get in this kit are a Silica Gel Desiccant, basic razor blade, a Derma Safe Utility knife which is a military grade in terms of quality, treble hooks and more. The design and durability of the product are what make it apt for both fishermen as well as survivalists. 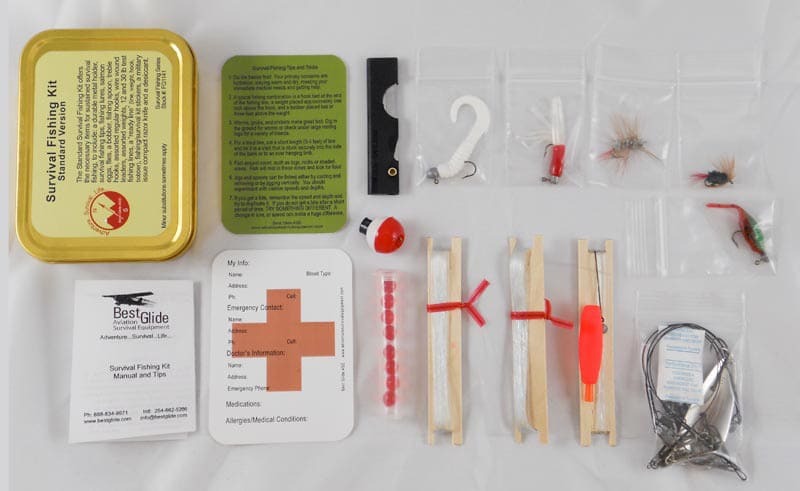 In terms of survival kits, Itsy-Bitsy Fishing Wilderness Survival Kit is perfect if you are thinking of travelling ultra-light as each of the 4 basic survival kits here are not more than 1 ounce of weight. 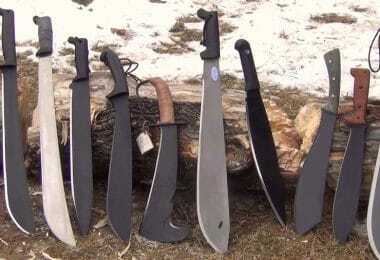 Don’t be fooled by their small size as they have all you need for survival fishing kits. For starters, there are four of these packs when you buy them which means you have 4 times the advantage over your fellow survivalist. Now, let us look at the contents of the individual packs to understand as to what makes it so popular. For starters, each packet has a split shot which is sure to come in handy. Next come the all-important hooks which have a number of uses as far as survival fishing is concerned. Moreover, here you will also get foam strips which are necessary for the bobber or attractor. At the end, it is worth mentioning that each of the packs comes with a metallic flash which is something you need in your survival fishing kit. What makes it such a popular product is the design of the kit, which is really unique and light. In addition, it is also known in the market for being one of the best as far as bug out bags are concerned. 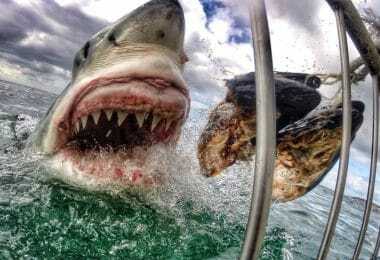 Lastly, it may be said that it is quite cheap and has all the bare essentials; it is for these reasons survivalist prefer this survival fishing kit. If you are one of those who are attracted to tough terrains then Rothco Survival Fishing Kit is for you. Firstly, this fishing kit is particularly designed for those users who are considered to be tough. Moreover, this kit will also assist you even in the roughest, rugged and unbearable terrains with absolute ease. 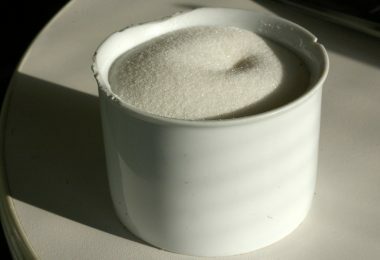 In order to further their claim to produce the strongest product, the manufacturers put it through the toughest of tests to get its quality tested. In addition, most users offered positive reviews as far as the durability of the kit is concerned which is a big positive. 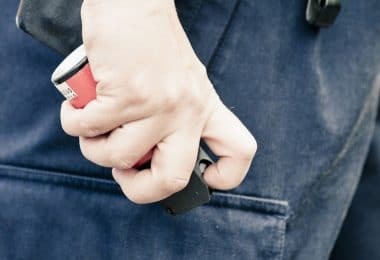 Another reason which makes it so handy, is for the simple reason that it is totally a performance-driven product, which is something a survivalist will need when he is out in dangerous and combative terrains. The contents of this survival fishing kit include a jig hook, folding blade, fishing line, steel fishing hooks, floating bobber, and more. This is one of those survival kits which is perfect for all kind of people including those who just want to use it for fun. Specifically designed for light packers, the Best Glide Survival Gear FG1250 is the dream for people who need a fishing kit which is easy to carry around. It just weighs around 0.8 ounces which will give you comfort and an option to move around freely through tough and dangerous terrains. One of the definite advantages that you get with this kit is the re-sealable plastic bag in which all the utility items are stored. What this effectively means is that you will be able to use it to store the utility items even after using them. As far as the contents are concerned, you will find a desiccant which is there to take care of the atmospheric moisture. 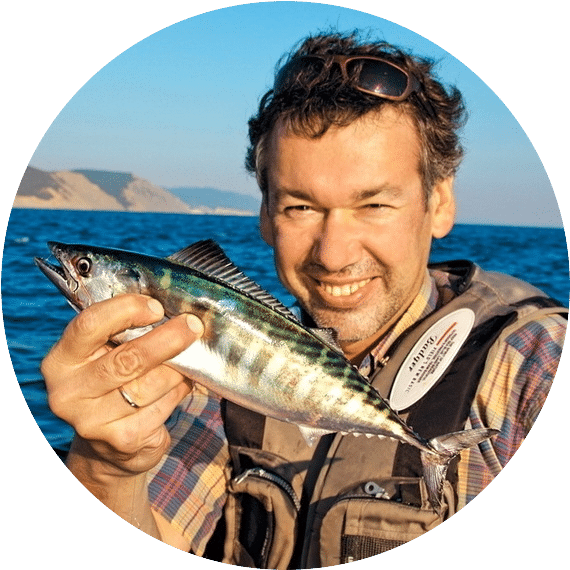 Moreover, for the purpose of fishing, you will find fishing lures, bait holders, a fly, salmon eggs, which is more than sufficient to catch a fish. In addition, there is a fishing line, assorted weights, floats, a leader, and all are neatly tucked into the re-sealable plastic bag. The compact design of the survival kit is what makes it attractive to survivalists as it aptly portrays how handy it is. 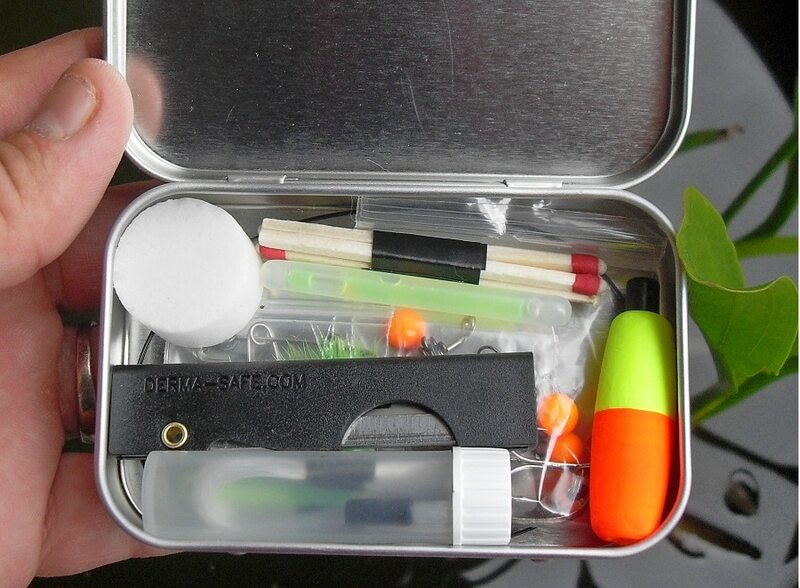 This Survival Fishing Kit is lightweight, it can be easily carried around in the pocket, without having to worry about the size and weight. It also comes with water resistant storage tin and easily fits in your pocket. And it also has everything you need for the emergency situation. Good product. That’s about all we had to say about the best fishing kit to use in a survival situation and the products that compete with it. We would love to hear back from you so, if you tried any of these in your travels, please let us know in the comments. Before you head out to fish, check out our review of the top backpacking fishing gear to help you with more options.